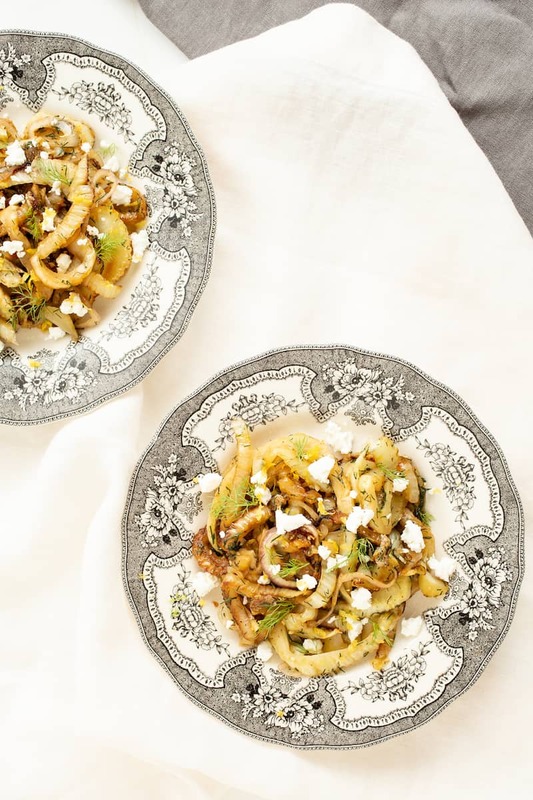 Ottolenghi's Caramelized Fennel Salad | Good. Food. Stories. After nearly four months of living in London, one of the things that continues to amaze me is that in spite of being a massive global metropolis, there is a distinct, local feel to each of the city’s neighborhoods. A huge part of that is the incredible weekend markets everywhere you turn. Waking up early, tote bags and grocery lists in hand, hangover or no hangover, has become a highly anticipated Sunday ritual. In the same vein, Yotam Ottolenghi’s low-key cafés that pop up throughout London celebrate the city’s market culture and have become a huge favorite. The Israeli-born and London-based chef focuses on simple, fresh, uncomplicated food infused with Mediterranean flavors. Sounds simple and run of the mill, but it’s anything but. I live closest to the Islington location, a lovely, bright space teeming with gorgeous pastries, their signature oversized meringues, and endless platters of salads, all nearly overflowing with root veggies, grains, herbs, and spices of every kind. It’s hard not to be struck immediately with all the senses. Rustic, messy, and abundant, the food is beautifully presented and the whole environment so inviting. But as wonderful as the café as, whether you’re grabbing brunch with the morning paper or a dinner of shared small plates capped off by a soothing mint tea, it’s the chef’s latest cookbook, Plenty, that has got me totally obsessed. Along with essentials like a bank card, cell phone, and Ottolenghi’s scarily overpriced but absolutely addictive housemade granola, I’m pretty sure the cookbook was one of my first purchases as soon as I arrived to London and it has been like a bible ever since. First of all, I have it to thank for imparting me with the essential London farmers market glossary. Aubergine = eggplant; courgette = zucchini; coriander = cilantro and the list goes on…. I know, I’m still reeling from all this culture shock, but very grateful to have these pillars of Ottolenghi cooking now firmly planted in my culinary repertoire. The book is filled with luscious full-page photographs and recipes that spotlight and celebrate a particular ingredient. I love that vegetables take center stage—these are not just side dishes, and many are hearty and complex enough to make up a main course on their own. 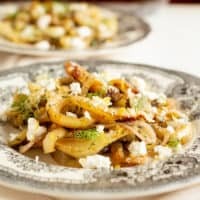 This is not because Ottolenghi seeks to cater to vegetarians, but more because much of his cooking is market-driven and so original in its treatment of veggies. 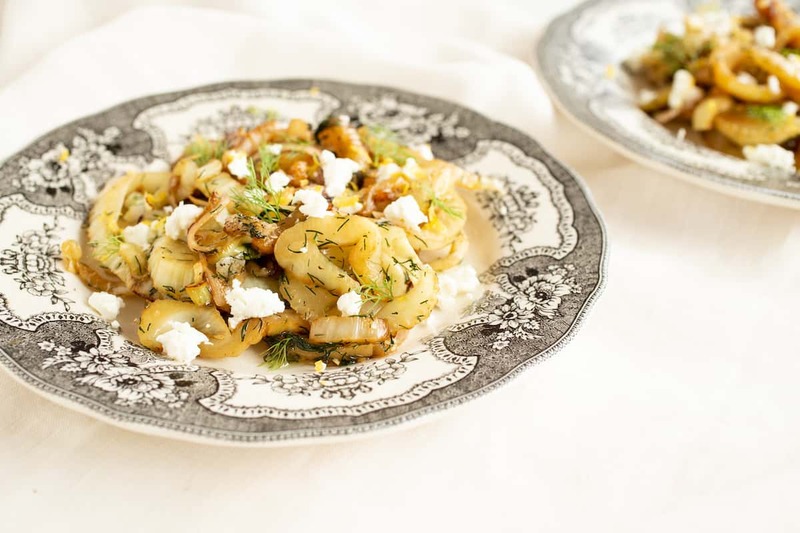 One of my favorite recipes from the book is caramelized fennel with goat’s curd (sometimes tough to find and can be substituted with a creamy, young, and fresh goat cheese). I used to despise the licorice flavor of fennel, but over the years, it’s become one of my go-to ingredients. Delicately fresh in paper-thin slices over arugula and Parmesan salad, it’s also incredible when roasted, mellowing out and taking on a sweeter, milder flavor. 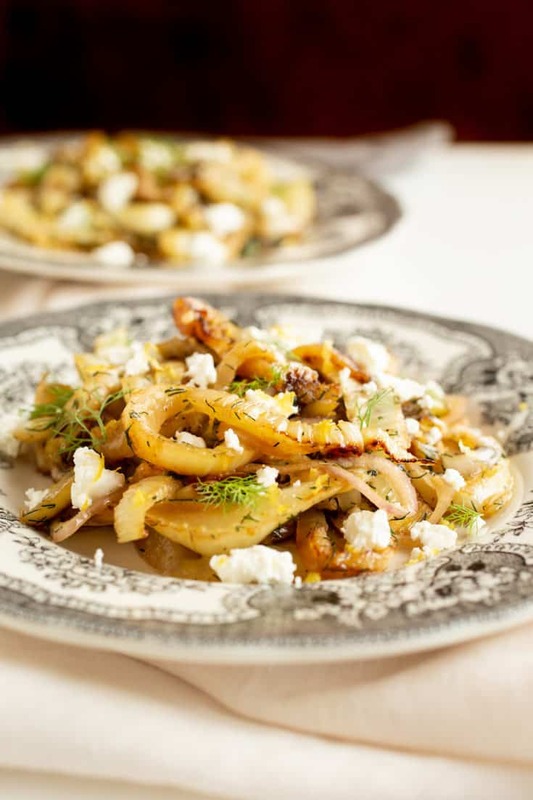 Caramelized fennel from Yotam Ottolenghi's Plenty cookbook brings out the vegetable's natural sweetness. Serve with goat cheese and lemon zest. Whisk the sugar, salt, and pepper together in a small bowl and set aside. Trim the stalks and root end from each fennel bulb, reserving 1 tablespoon's worth of minced fronds for garnish. Slice the bulbs into 1/2-inch thick rounds. Melt 1 tablespoon butter and 1 tablespoon oil in a 12-inch skillet over medium-high heat. Add 1/3 of the sliced fennel in a single layer, making sure not to crowd the pan. Cook until just browned, about 2 minutes per side. Flip the fennel carefully so the slices will brown as evenly as possible. Transfer the fennel to a large bowl. At this point, the rounds will break apart into individual slices, and that's just fine. Repeat 2 more times with the remaining butter, oil, and fennel rounds. Add the sugar, salt, and pepper to the skillet and cook for 30 seconds, stirring constantly. The sugar will clump and soften as it cooks. Return the fennel to the skillet and stir to coat with the caramelizing sugar. Cook for another 1-2 minutes, stirring occasionally to make sure the sugar cooks evenly. Return the fennel to the bowl, scraping up as much of the browned bits in the pan as possible too. Add the garlic, shallot, and dill to the fennel and toss to combine. Pour onto a serving plate and top with the goat cheese, lemon zest, reserved fennel fronds, and a drizzle of extra virgin olive oil.